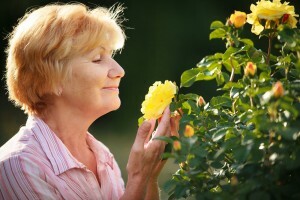 Elderly Care in Matawan NJ: Elderly Care Awareness: Have You Heard of Anosmia? Elderly Care Awareness: Have You Heard of Anosmia? Can you imagine going through a day of your life without being able to perceive the smells around you? Think of what it would be like to get up and not smell coffee brewing or breakfast being made, to not be able to smell flowers or that smell that tells you that rain is coming. Even worse, think of what it would be like to not be able to tell if that milk that is close to expiration has gone bad or if the leftovers tucked in the refrigerator are still good. As something that is so very often taken for granted, the sense of smell is an integral part of most people’s lives even if they do not realize it. The loss of that sense, called anosmia, can be a difficult experience that challenges quality of life and can even put health and safety at risk if it becomes a part of your elderly care journey with your seniors. The term “anosmia” does not refer to a single type of loss of the sense of smell or a single cause of the sensory loss. Instead, it is a blanket term that simply refers to the lessening of acuity or the complete loss of the ability to perceive odors. This condition can be relatively minor and temporary, or severe and permanent depending on the cause and how that cause is treated or managed. Because there are so many potential causes for the loss of sense of smell, it is vital that you bring this symptom to the attention of your senior’s doctor as soon as possible. This will enable the doctor to five your loved on a thorough examination and come to a proper diagnosis so that he can devise a course of treatment or management that is appropriate for your senior. Something very important to keep in mind about anosmia is that the sense of smell plays an important role in your ability to taste food properly. Without being able to smell, you will be able to somewhat perceive the flavor of something, but it will not be as intense or as enjoyable. For this reason many people falsely believe that they are losing their sense of taste when it becomes more difficult for them to perceive the flavor of their food rather than the loss of their olfactory functioning. In truth, the loss of sense of taste is far more rare and could be an indication of more severe issues. If your senior mentions not being able to taste, says that the food is not as enjoyable, or does not seem to be eating as much as usual it may be because she is coping with anosmia and is not enjoying eating. Be sure to talk to her doctor about this particular issue so that he can closely evaluate your loved one and really get to the root of the problem. If you or an aging loved one are considering in-home elderly care in Matawan NJ, please contact the caring staff at Lares Home Care 1-800-781-7435 or 732-566-1112.